Brazilian Adriano de Souza completed a spectacular year on the World Surf League Championship Tour when he was crowned the 2015 World Surfing Champion and won the season-ending Billabong Pipe Masters at the Banzai Pipeline in Hawaii on Thursday. Having never previously advanced beyond the last 16 in 10 years of trying at Pipeline, de Souza’s incredible work ethic saw him enlist the aid of Hawaiian standout Jamie O’Brien and spend literally thousands of hours in the hallowed, hollow tubes of the iconic break to improve his knowledge and expertise. Practice makes perfect and he battled giant waves and the world’s best surfers before outsurfing compatriot and defending World Champion, Gabriel Medina, in really tricky 1-1.5m waves in the final, becoming the first Brazilian to claim the Pipeline Masters title. The 28 year-old’s journey to the top award in surfing began in the dusty streets of a favela (township) in Guaruja in the south of Brazil when his older brother bought him a surfboard for seven Dollars in 1998 at age nine. Within three years he had qualified for the Brazilian team that competed in the Quicksilver ISA World Surfing Games in Durban in 2001, where he made an instant impact by posting a perfect 10 point score on the opening day. Going on to reach the final in the under-18 division of the event, de Souza’s already apparent uber competitiveness led to him dropping in on local favourite Ricky Basnett, leaving the Brazilian with an interference penalty and a minor placing, but hindering Basnett’s chances and handing the World Junior title to Durbanite Warwick Wright. Returning two months later to compete in the Mr Price Pro, the 13-year-old was detained by customs officials at Durban Airport for ten hours when a communications mishap resulting in his sponsor’s representative not being there to collect him. De Souza was unable to explain what he was doing in South Africa or where he was going as he did not know a word of English! He qualified for Championship Tour, the global series of events in which the top 32 ranked surfers compete for the annual World Title, by winning the Qualifying series in 2005 with what was then the highest point total ever. Finishing 2006 ranked 20th and just re-qualifying in 28th spot in 2007, he then became a fixture in the top 10 for the next five years before slumping to 13th in 2013, rising to 8th last year, and now he’s achieved his lifelong dream by becoming the World Surfing Champion! Medina, who looked unbeatable at Pipeline, ended rankings frontrunner Mick Fanning’s path to a fourth World Title with a highflying aerial manoeuvre in their semifinal encounter on Thursday. Although he could not repeat that in the final against de Souza, Medina nevertheless became the first Brazilian to clinch the coveted Triple Crown of Surfing title for accumulating the highest points total through the three Hawaiian events at Haleiwa, Sunset Beach and Pipeline. De Souza, Medina, Filipe Toledo and the rest of the aptly named Brazilian Storm completely dominated the World Surf League this year, winning six of the 11 event titles on the Championship Tour. And Italo Ferreira won the 2015 WSL Rookie of the Year title by ending the season ranked No. 7 while Caio Ibelli clinched top spot on the Qualifying Series rankings. The 2016 season is going to be really interesting! The country’s top young surfers are locked in a battle for the World Surfing League Africa Junior titles at Seal Point in Cape St Francis this weekend. After a delay for fog, the third and final event in the 2014 / 2015 Billabong Junior Series got underway on Friday as excellent waves reeled down the long rock-strewn point. The highest ranked competitors justified their preferential seeding and confirmed that local competitive surfing has a bright future. Jeffreys Bay local Dylan Lightfoot, who heads the Under 20 Men’s rankings, showed the benefit of campaigning on the international circuit by posting both the highest single ride score, a near perfect 9.25 out of 10, and the highest heat total of the day, 15.75 out of 20, in winning his round one heat. Defending event winner and 2014 WSL Africa Junior Champion, Shane Sykes of Salt Rock, demonstrated that he will not be relinquishing his titles without a fight by winning his opening encounter convincingly, as did the next three on the rankings – Jordy Maree, Matt McGillivray and Adin Masencamp. In the Under 20 Women, multiple South Africa team member Chanelle Botha and Taghiti Gericke were the standouts on the opening day. They will come up against the top seeds Nicole Pallet, Teal Hogg and Gina Smith when round two gets underway today. Along with the country’s most prestigious titles for surfers aged 20-and-under, there are also four places at stake for men and two for women in the WSL Africa regional squad team who will compete in the World Junior Championships in January 2016. Meanwhile in Europe, South African surf star and current world number four, Bianca Buitendag, slipped to second place in her first heat at the Cascais Women’s Pro which got going at the backup venue of Guincho in Portugal after three successive lay days due to small swell and adverse winds. But Buitendag bounced back to form in round two, defeating local wildcard Theresa Bonvalot and she faces a matchup with number five ranked Californian Lakey Peterson and Hawaiian Alessa Quizon in round three when competition resumes. Watch the action in Portugal live at http://bit.ly/1NY72A5 from 9am daily. And the inaugural ISA World Adaptive Surfing Championships presented by the Challenged Athletes Foundation also had its first day of action on Friday after the opening ceremonies and a well attending adaptive surfing clinic the previous day. There are five South African athletes among the 65 competitors who are competing in divisions that include those who can ride kneeling or standing up, sitting on their craft, laying on their craft or those who need assistance catching waves and getting back onto their boards, but ride the waves independently. These inspiring ocean lovers can be seen inaction at http://bit.ly/1jipcQc from 5pm today and tomorrow. Jeremy Flores clinched the prestigious Billabong Pro Tahiti title at the storied surfbreak of Teahupo’o on Tuesday, defeating reigning World Champion and defending event champ Gabriel Medina in the final. Flores’ victory was all the more remarkable as it came in his first contest appearance since suffering an horrific head injury while free-surfing in a remote area of Indonesia in June. He had to be airlifted out and was then flown straight to France for treatment. 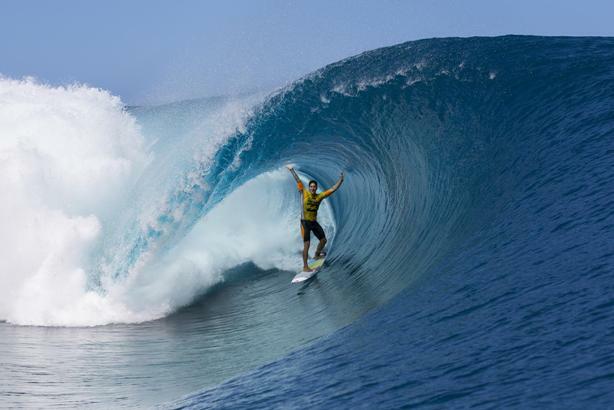 Flores wore a helmet while competing in Tahiti to prevent any further injury on the shallow, razor-sharp coral reef that lies just below the surface at Teahupo’o. The Reunion Island born Frenchman also was very selective, only taking two waves in the difficult to read two metre hollow surf during the final. He recorded a near-perfect score of 9.87 out of 10 on the first and then adding a 7.0 s while Medina rode eight waves, the best of which earned the Brazilian a 7.17. Flores stellar run saw him defeat former World Champions Joel Parkinson of Australia and Floridians Kelly Slater and CJ Hobgood on his way to the final and them jump five places to No. 7 on the rankings. Adriano de Souza of Brazil retained the Jeep rankings leader’s yellow jersey when he and his closest rivals, Australians Mick Fanning and Julian Wilson, all bowed in round three. Owen Wright, who finished equal third with Hobgood, overtook Wilson and moved into third spot with the top five separated by a slender 1 500 points. Durbanite Jordy Smith has slipped to No. 23 and outside the top 22 who automatically re-qualify for the elite tour next year. Smith injured his knee in Rio de Janeiro in April, missed Fiji and then returned for J-Bay, only to hurt his back which saw him withdraw from Tahiti. The good news is that the next event is at Trestles in California where Smith is the defending champion and near to the home he set up in San Clemente last year. After Trestles the Tour stops in France and Portugal, where Smith has posted excellent results in past seasons, before ending at Pipeline in Hawaii in December. The country’s emerging crop of pro competitors have been busy on the Qualifying Series with Umhlanga’s Beyrick de Vries moving up to eight spots to No. 35 on the QS rankings after an excellent third place finish in the Vans Pro at Virginia Beach,USA. Meanwhile, on the other side of the North Atlantic, the likes of Jeffreys Bay’s Dylan Lightfoot and Matt McGillivray and Durbanites David van Zyl and Slade Prestwich have shown impressive form in both QS and Pro Junior events on the European leg of the series that sees the top 10 in the yearend rankings qualify for the Championship Tour. Durban’s Shaun Tomson, the 1977 World Champion whose photos adorned the walls of thousands and surfers, both male and female, during the 1970’s and ‘80’s, turned 60 last week. The country’s most influential international surfer, now a motivational speaker, author and movie producer, lives with his family in Santa Barbara, California. The rankings lead on the World Surf League Championship Tour is set to change hands after current leader Adriano de Souza and second placed Mick Fanning were both bundled out of the Billabong Pro Tahiti in major upsets in round three earlier this week. De Souza has worn the yellow jersey since he won the Drug Aware Margaret River Pro, the third stop on the 11-event tour that decides the annual World Surfing Champion, back in April. However, his record in the hollow waves of Teahupo’o has been blighted by wildcards over the past four years, and that proved to be the case again this year. After finishing second to fellow Brazilian and wildcard Bruno Santos in round one, de Souza redeemed himself with a convincing win over local Tahitian wildcard, Taumata Puhetina, only to find himself facing Santos again in round three. Santos, whose prowess at Teahupo’o saw him win the 2010 event as a wildcard, dashed de Souza’s hopes of retaining the rankings lead by repeating his round one victory. This left the way open for Fanning to claim the yellow jersey, but the Australian who had settled his competitive nerves by winning his first competitive heat since his much publicised shark encounter at Jeffreys Bay last month, simply could not find any high scoring waves and was ousted by hard charging New Zealand rookie Ricardo Christie. Australians Julian Wilson and Owen Wright along with Brazilian Filipe Toledo, the winner of two events already this year, now have the opportunity to leapfrog de Souza and Fanning into the rankings lead with high place finishes in Tahiti. The most competitive heat of the year played out just before the drama with the top seeds when arguably the planet’s two most talented young surfers, reigning world champion Gabriel Medina and Hawaiian John John Florence, produced an incredibly high scoring clash in the perfect two metre hollow waves. The Hawaiian consolidated his lead with a 9.07 and Medina came close to the 9.58 he then needed with a 9.27. Florence looked to have clinched the win and berth in the last 12 in the event with a 9.44 but Medina was not to be outdone and he paddled far into the lineup before taking off on a wave that looked unmakeable. Somehow managing to generate enough speed to burst through the curtain of water as the wave pinched closed, he posted the heat’s highest score of 9.73 and clinched a 19.00 vs. 18.84 point victory. Organisers are expecting bigger waves for the final two days of the event on Monday and Tuesday. All the action can be watched live at worldsurfleague.com starting at 8pm daily. The completion of the 50th annual South African Surfing Championships at Richards Bay last weekend has awakened memories of a bygone era when surfing was considered a fringe activity and not the highly organised global sport performed by professional athletes it has become today. The first official national championships was held in Durban in July 1966 with provincial teams from Natal, Border (East London), Eastern Province (Port Elizabeth) and Western province (Cape Town) participating. After two days of dismal half metre waves at Dairy Beach, organisers opted to run Saturday’s heats at Ansteys Beach on the Bluff. After the Junior Men (18-and-under) had been sent out first into overhead two metre waves, the Open Men took to the surf in a rising swell producing consistent three metre waves and occasional four metre sets. Many competitors struggled to paddle through the mountains of whitewater to catch unbroken waves and only the top watermen such as Robbie McWade of Durban and Peter Basford of Cape Town comfortable dealing with the conditions. Ironically the standout of the day was a non-contestant, Durban lifeguard Neville Calenbourne, who was immortalising when his ride on a five metre high wall of water was captured by photographer John Thornton and published in the following day’s newspaper. The contest was completed the next day in half metre waves at Dairy Beach with McWade becoming the first South African surfing champion while Capetonians secured the rest of the titles with Donald Paarman in the Junior Men, Margaret Smith in the Women’s division and John Whitmore in the Senior Men (over-35). The South African Surfing Association (formed in September 1965) then selected their first Springbok surfing team to participate in the ISF World Surfing Championships in San Diego, California that October. The trip, paid for by the United States Surfing Association, saw the Bok team cause a stir on the beach when they arrived for the opening ceremony clad in collars, ties and green blazers amongst the casual and colourful hippie attire worn by their contemporaries from the rest of the surfing world. Tributes to Peter Daniels have flooded social media and surfing websites globally after the legendary Durban born surfboard shaper passed away in Northern Spain earlier this week. Globally acknowledged for his expertise in designing and hand shaping in excess of 40 000 surfboards in a career spanning more than four decades, ‘Pepsi’ honed his skills while living in Jeffreys Bay in the early 1970’s and produced equipment for many of the world’s best surfers while living according to his own rules in many of the world’s most popular surfing locales. 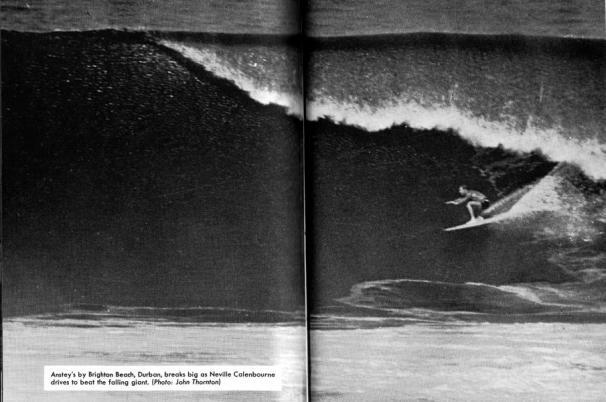 Daniels and Durban’s ‘Mr Surfing’, Max Wetteland, who passed away in early July, charted the course of modern day surfing through their artistry, energy and having the courage to defy convention and experiment with designs, materials and equipment that have become today’s standards. The world’s best surfers performing in big, hollow waves at Teahupo’o in Tahiti can be watched live at worldsurfleague.com during the Billabong Pro Tahiti starting at 8.30pm daily until 25 August. The world’s best surfers are bracing themselves for the challenge of riding one of the planet’s most dangerous waves when the Billabong Pro Tahiti gets underway at Teahupoo next Friday. Teahupoo, literally ‘the end of the road’ and colloquially known as Chopes, presents the ultimate test of a surfer’s skill. The long range swells from the South Atlantic rise up out of deep water and hurl themselves over an extremely shallow coral reef, creating some of the hollowest tubes anywhere. Last year’s event was won by Brazilian sensation Gabriel Medina whose flawless performance in triple overhead perfect barrels amazed everyone. Medina only suffered one wipe-out in the entire event, and that was in the Final where he went on to defeat multiple world and event champion Kelly Slater in a major upset. South Africa’s Jordy Smith, who broke a couple of ribs at Chopes in 2011, had what he called the worst wipe-out of his life there last year. During Round 2, Smith was annihilated by a huge wave and then had to deal with three more mountains of white-water while scrambling around on the razor-sharp coral before the safety crew on Jetskis could pick him up and drag him to the safety of the channel. Medina has had a torrid start to the defence of his 2014 World Title but showed a welcome return to form at Jeffreys Bay and will go into next week’s event as one of the favourites again. Others to watch will be the 43-year-old Slater, Hawaiian prodigy John John Florence and Owen Wright whose record setting perfect 20 point heat totals in Fiji demonstrated the Australian’s supreme skills in big, hollow, left-breaking waves. There is a 12 hour time difference between Tahiti and South Africa so the live webcasts on worldsurfleague.com start around 8pm each evening and will be well worth following. Bianca Buitendag has elevated herself into World Title contention after placing third in the Vans US Open of Surfing in California last weekend. Missing out on a third consecutive Final on the WSL Championship Tour by just 0.01 of a point when she was eliminated in the semis by close friend and eventual event winner Johanne Defay from Reunion Island, Buitendag nevertheless earned enough points to leapfrog two positions into fourth place on the rankings with four events remaining on the 2015 calendar. Beyrick de Vries from Umhlanga also boosted his ratings, moving up to No. 43 on the Qualifying Series rankings, while Dylan Lightfoot from Jeffreys Bay placed a creditable 7th in the Pro Junior event at Huntington Beach. The 50th annual Citroën South African Surfing Championships are currently underway in Richards Bay where competitors ranging in age from 16 to over 60 from eight regions are contesting both individual and team honours. The sport has certainly come a long way since the first official SA Champs which were held at the Wedge at the bottom of what was then West Street in July 1966! Scintillating performances by the South African surfers competing in the Vans US Open of Surfing in California have boosted the morale of the local surfing community after what can only be described as a dismal showing during the SA Leg of the World Surf League during July. Starting last Sunday at Huntington Beach, America’s official ‘Surf City’, the US Open is the showpiece of North American surfing and arguably the biggest surf festival / beach party on the planet. Featuring WSL events for men, women and Pro Junior (20-and-under) boys and girls, alongside longboard surfing, skateboarding, BMX, music and dozens of retail outlets, the eight-day beach extravaganza attracts tens of thousands of spectators. The SA challenge got off to a great start when Michael February from Kommetjie posted the highest heat tally of Round 1 in an all-star 32-man trials field for the QS10,000 men’s event. February impressed again by winning his Round 2 heat but came up just short in the semis, missing out on the chance to earn one of the two trialists slots into the main event. Dylan Lightfoot from Jeffreys Bay and Salt Rock’s Shane Sykes both shone while progressing through two heats each to reach the quarterfinals of the Pro Juniors while Beyrick de Vries from Umhlanga carved his way through the first two rounds of the men’s event, sidelining higher rated opponents along the way. Meanwhile Bianca Buitendag, SA’s sole representative on the elite WSL Women’s Championship Tour, made world headlines on Thursday when she upset current World No. 1 and two-time World and event champion Carissa Moore (HAW) to reach the semifinals of the women’s event. The lanky 21-year-old from Victoria Bay – at 1.85 metres she’s the tallest girl in the elite Top17 – won the US Open Pro Junior crown a couple of years back and faces close friend Johanne Defay from France in the semis on Sunday. Buitendag has already recorded her best US Open result and earned enough points to move into the Top 5 in the rankings even if she doesn’t reach the final. These positive results provide some solace for the local showing in the Ballito Pro and the J-Bay Open last month where just one local surfer progressed through a single heat – David van Zyl from Glenashley who advanced to Round 2 in Ballito before being ousted. Of the19 locals in the Ballito Pro Trials, the only standout was Matt McGillivray, 18, from Jeffreys Bay who won three consecutive heats before placing third in the final. Jordy Smith, Dale Staples, de Vries and February all stumbled at their first hurdle in the main event. It was a similar story at J-Bay where an injured Smith, February (a last minute injury replacement) and trials winner Slade Prestwich from Scottburgh all went two for zero and finished equal 25th. Even in the WSL rated Billabong Junior Series, the small international contingent dominated with Lightfoot claiming second place at his home break. The partisan SA surfing community will be hoping that their warriors have turned the corner at the US Open and will continue to post the results their talent deserves for the rest of 2015. This world’s biggest news story this week unfolded at Jeffreys Bay when Australian surfer Mick Fanning experienced arguably the most comprehensively recorded shark encounter of all time just minutes into the Final of the J-Bay Open last Sunday. The incident took place in perfect conditions, pumping 1.5 to 2 metre waves and in front of a couple of thousand spectators on the beach and tens of thousands more around the world glued to the live TV and internet coverage provided by the half-a-dozen high definition cameras focused on the action. Fanning, a former three time world champ and three-time and defending J-Bay Open champion, was waiting for his first ride as his opponent and fellow Aussie Julian Wilson paddled back to the line-up after his opener. Sensing something behind him, Fanning was confronted by a large shark that became entangled in his legrope before knocking Fanning off his board, snapping the leash in the process. Separated from his board, Fanning started swimming for shore as Wilson changed direction and, ignoring his own safety, paddled towards his friend to offer assistance. The vigilant water safety crew reacted immediately and were on the scene within 15 seconds. Marine safety expert Grant Spooner circled the area in his 6 metre inflatable boat to ward off any further action by the shark while jetski pilots Jeremy Phillips and Paris Basson plucking Wilson and Fanning from the ocean. Executing the well defined safety plan perfectly, the surfers were delivered to nearby Magnatubes Beach where emergency medical staff and an ambulance were already waiting. Miraculously Fanning emerged physically unscathed from the attack and after being treated for shock the surfers were returned to the contest site by car. Following consultation between the surfers and WSL Commissioner Kieren Perrow, it was eventually decided to cancel the rest of the Final. The surfers were awarded equal second place points while the US $140 000 prize-money at stake in the Final was split evenly with each receiving $70 000 (about R850 000). What followed can only be described as a media frenzy as news outlets, including the world’s biggest organisations, broadcast and published the graphic video footage, high resolution images and interviews with anyone involved. Opinions swirled around on whether it was an attack, and encounter or an incident, the type and size of the shark, whether the WSL had sufficient safety in place and if a surfing event would ever be held at Jeffreys Bay again. To their credit, the WSL handled the circumstances with aplomb, issuing a statement that the surfers’ safety was the primary concern and applauding the actions of water safety crew, while the commentators and analysts calmly reported live on a scenario that was unprecedented at a major event. Thanks to Fanning’s bravery, Wilson’ heroics and the exceptionally fast reaction of the safety team, a situation that could have had a far worse outcome was averted. And 30 minutes later local surfers were out at Supertubes enjoying the excellent waves peeling down the point! The local surfing community and hundreds of thousands of followers online are being treated to spectacular surfing by the planet’s premier performers in the battle for points and prize-money on the lucrative South African leg of the World Surf League. Starting with the Ballito Pro, where Michael Rodrigues posted a rare perfect 10-point ride before fellow Brazilians Italo Ferreira, Caio Ibelli and Alejo Muniz racked up a slew of high-flying manoeuvres in the pristine final day conditions, and continued in Jeffreys Bay where the J-Bay Open commenced yesterday. For the record, Muniz took the win at Ballito, pocketing the R500 000 winner’s payout and shooting to a substantial lead on the Qualifying Series leaderboard thanks to his haul of 10 000 points. This virtually ensures him a spot among the Top 34 surfers who will contest the 2016 Championship Tour, the elite series of events that determine the annual world surfing champion. In Jeffreys Bay, the sixth of 11 stops on this year’s CT, the world’s best displayed their prowess in testing conditions on the opening day of competition. Despite a 12 day holding period in which to run the four days of heats required to decide the winner, the wave and weather predictions have been blighted by summer-like conditions with Easterly onshore winds replacing the customary Westerly winds that prevail in the winter months. With a solid overhead swell steaming down the fabled 300 metre dune lined point known as Supertubes, WSL Commissioner Kieren Perrow had no hesitation in sending the surfers to work even though onshore winds were forecast. And those watching were certainly not disappointed as the likes of Tahiti’s Michel Bourez, Australian Julian Wilson and dangerous wildcard, Dane Reynolds from California sliced, diced and carved up the long liquid walls, boosting themselves above the lip of the waves and landing in full control to post heat winning totals. The unfavourable wind became stronger but the bumpy wave faces did not deter defending event champion Mick Fanning from Australia whose trademark high-speed manoeuvring took him to victory. The legendary Kelly Slater, a four-time J-Bay event winner, was in his element. The Floridian took to the air on one ride and then somehow found a tube section on another to record two of the highest scores of the day’s action, along with the highest heat tally. The South African contingent in the event will all need to contest sudden-death elimination heats in Round 2 when competition resumes. Capetonian Michael February, a last minute replacement for the injured Australian Matt Banting, finishing second behind Fanning in his first foray at the highest level of the sport. Slade Prestwich from Scottburgh, winner of the JBU Supertrials, finishing third in his encounter and Durban’s Jordy Smith also placed third after an uncharacteristically low scoring performance that saw the current World No. 18 head directly to the medical facilities after his heat for treatment on a back spasm. The holding period for the J-Bay Open runs until 19 July and the event can be watched live at worldsurfleague.com.